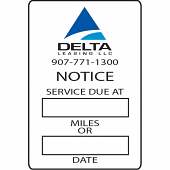 Oil Change Labels are an important way to remind you customer about your business and brand. Oil Change Stickers - 2 1/2" x 1 1/2"
Fully customize your oil change stickers at a very economical price. Customized with your logo, company name, contact information, services offered etc. These clear vinyl Oil Change Stickers cling to glass or any smooth surface by static electricity or light adhesive. For your convenience we have provided 6 standard styles to help you with designing a layout. So you can choose from one of our standard layouts, or we can match your existing oil change label.